CHIVI – Luck has no age! A four-year-old toddler from Chivi Growth Point is the lucky winner of a Toyota Vitz after her mother, a vendor bought him a $2 ticket in the Police Commissioner General Godwin Matanga Raffle. An elated Blessing Musarira (29) said she never expected that her son Munenyasha Makotose would win in the raffle. The car was collected from Ntabazinduna in Bulawayo last week Tuesday where the raffle draw took place. Police National Spokesperson Chief Superintendent Paul Nyathi said all the winners received their prizes last week. The toddler’s father Tafirashe Makotose(38) is a mechanic. 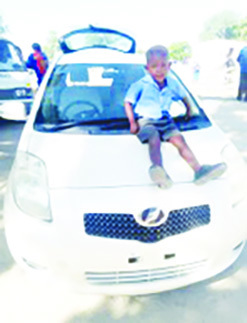 Musarira said she was filled with joy when she received a call that her son had won a car. “I never expected that, I was very happy when I was called to come and collect the car, it is a big development in the family. I am just a mere vendor at the Growth Point and I thank God for such a blessing,” said Musarira. Munenyasha is in Early Childhood Development (ECD) A at St Luke Primary School in Chivi.